There is no food richer in meaning than rice: life, wealth, and prosperity accompany this grain, a cornerstone of Italian cuisine. The land where it is grown is like a checkered sea: a spectacle of colors and reflections that tradition turns into delicious dishes. Rice was a common ingredient, actually a cereal, in ancient China and India. According to archaeologists, rice originated fifteen thousand years ago on the Indian side of the Himalayas. Rice is an important ingredient for the populations of the Far East who base their diet on this food. Alexander the Great introduced rice to the Persians and then scientists brought it to the Middle East. Over the centuries, rice finally made its way to Europe, first in Greece, then in the Roman lands, where it was never cultivated, but imported. Rice remained an expensive food for Western Europeans who used it in small doses as a cosmetic or to fight against intestinal disease or fevers. Wealthy Romans used rice flour to make a cream that they would spread all over their faces and necks to soften and brighten their skin. The most spectacular period of progress of the Italian rice cultivation began in the middle of the last century, when Vercelli farmers built one of the most efficient irrigation systems. Today. Italy is the leading producer of rice in Europe, with the majority of it being grown in the Po River Valley. Lombardy is home to the best rice-growing area, the Lomellina, while Piedmonte and Veneto also have abundant rice harvests. Rice thrives so well in the Po Valley that first courses of risotto are more common than pasta and are a great way to serve whatever is in season, from seafood to wild mushrooms (such as Porcini) to meat and game. 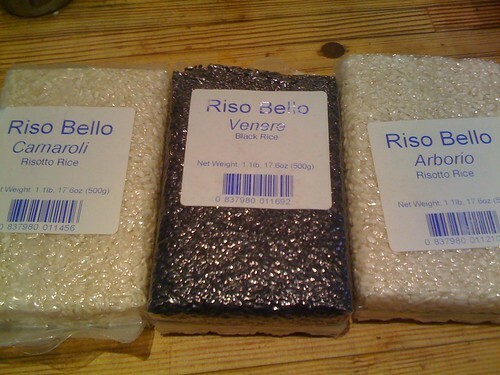 Anyone who has had a perfectly prepared risotto dish knows just how serious the people of this area take their rice. That is not to say that other regions of Italy do not eat rice, as there are wonderful recipes for using the many varieties grown throughout Italy. From soups to desserts, Italian rice is well utilized. Rice, like eggs, comes in different sizes and grades. Italian rice is graded according to length (short or long), shape (round or oval) and size (small, medium or large), as well as wholeness (broken grains are appropriately downgraded). Italy grows mostly short, barrel-shaped rice that is different from the long-grain rice that is usually boiled or steamed in other parts of the world. The four main categories based on grain size are comune, semifino, fino, and superfino. The superfino rice is the type most used for risotto, with Arborio being the most recognized outside of Italy. However, Venetian cooks prefer the Carnaroli variety, which was invented in the 1950’s. Baldo is another variety well-known for making excellent risotto and classified as semifino. *Comune or originario: The cheapest, most basic rice, typically short and round. It is used mostly for soups and desserts, never risotto. The rice most often seen with this grade is the Balilla variety. It cooks faster than other grades. *Semifino: This grade, of medium length, maintains some firmness when cooked. Risotto can be made with a semifino grade, although semifino is better used in soups. The rice variety most often seen with a semifino grade is Maratelli. *Fino: The grains are relatively long and large, and they taper at the tips, creating an oval shape. Fino-grade rice remains firm when cooked. Several varieties are commonly graded fino, including Vialone Nano, Razza 77, San Andrea and Baldo. *Superfino: This grade represents the fattest, largest grains. Superfino is the province of the two best risotto varieties, Carnaroli and Arborio. They take the longest to cook, as they can absorb more liquid than any of the others while still remaining firm. Italian rice is not just limited to risotto; one of the more famous non-risotto rice dishes is Minestrone alla Milanese. The city of Milan’s hearty vegetable soup makes use of Lombardy’s abundant rice. In the Veneto, Peas and Rice (Risi e Bisi) is a popular “wet” risotto that is like a soup made with rice and peas, but thick enough to eat with a fork. Riso al Salto is a way to use up leftover risotto – pressed into patties and fried in butter. Another frugal use of leftovers is to add the rice to eggs for an Omelette di Riso. Suppli and Arancini (little oranges) are fried rice balls with a filling usually of cheese; they are a popular snack found in Italian cafes and bars. Rice stuffed tomatoes make an excellent antipasto, especially with the large tomato varieties grown around the Bay of Naples. Rice is also used in desserts, such as Sicily’s – Dolce di Castagne e Riso – a rice pudding flavored with chestnuts. When Italians are not making Risotto, they treat their rice like pasta. They immerse it in a large pot of water, boil it, salt it and strain it. Unlike many Asian and Indian rice varieties, Italian rice is never rinsed or soaked before use. The rice is sold in vacuum-packed bricks which stops the grains from rubbing against each other during transport (breaking and scraping the kernels). This unique packaging also keeps the grains “fresh” and ensures no debris or insects entered the bag after the rice was cleaned, aged and dried under the controlled conditions. Arborio rice is great for most cold rice dishes, just be sure not to over cook it. Bring a large pot of water to a boil. Add salt and rice, stir, and adjust heat to maintain a simmer. Cook, stirring occasionally to prevent any grains from sticking to the pot, until the rice is just barely done, about 15 minutes. It will continue to cook as it cools. Drain the rice in a fine mesh colander and spread it out on a baking pan brushed with olive oil to cool quickly. Put the lemon juice in a small bowl. Season with salt and pepper. Gradually whisk in the olive oil. In a large bowl, combine the cooled rice and any combination of ingredients from the list below. Toss. Pour the dressing over the salad (you may not need it all) and toss gently. Taste and adjust seasoning. Add a green salad to round out the meal. Beat eggs with salt and pepper in a medium bowl. Heat a saute pan over medium heat, Add butter and let it melt. Pour eggs directly over the butter. Tilt the pan to spread the uncooked eggs in the pan. Put the remaining ingredients: rice, salami, cheese and onions in the center of the omelet. Fold one side of the omelet over the ingredients and cook it for 4 to 5 minutes over low heat until the filling gets heated enough. Turn out onto a serving plate. Heat the olive oil in a large nonreactive saucepan. Add the onion and red bell pepper and cook over moderately high heat, stirring occasionally, until softened and lightly browned, about 6 minutes. Add the carrot, potato, zucchini and yellow squash and cook, stirring often, for 5 minutes. Add the rice to the saucepan and toss well to coat the grains with oil. Add the tomatoes, 1 teaspoon salt, 1/4 teaspoon black pepper, the crushed red pepper and 6 cups of water and bring to a boil over moderately high heat. Add the cauliflower, celery and peas and cook, stirring, until all the vegetables and the rice are tender, about 35 minutes. Season the soup to taste. Ladle the soup into bowls and serve with Parmesan. In a large skillet combine red beans or kidney beans, undrained tomatoes, broth, rice, lima beans, green beans, and basil or Italian seasoning. Bring to boiling. Reduce heat. Cover and simmer about 15 minutes or until rice is tender. Stir in marinara sauce. Heat through. Top with Parmesan cheese. Bring water, salt, and butter to a boil in a medium saucepan. Add the rice, return to a boil, and then reduce the heat to the lowest setting. Cook until the rice has absorbed the water but still al dente, about 15 minutes. Pour into a bowl. Bring milk, sugar, vanilla, and a few dashes of cinnamon to a simmer in the saucepan. Add the cooked rice and cook at a simmer over medium-low heat until the rice absorbs most of the milk and mixture starts to get thick and silky, about 10 to 15 minutes. Transfer pudding to a large bowl and cool to room temperature. Place in the refrigerator until cold and set. Serve with a dash of cinnamon. Spray a 9 inch round cake pan with cooking spray and flour the bottom. In a large saucepan, add the milk, 2 cups water, sugar, grated lemon peel and a pinch of salt. Bring to a boil, then add the rice and cook until it has absorbed all the liquid, 25-30 minutes. Remove the pot from the heat, stir in the butter and let cool. Once the rice is cool, pour into an electric mixer bowl and add the eggs one at a time, mixing well after each addition. Stir in the almonds and citron. Mix well, then pour into cake pan. Bake for 30 minutes. Take the cake out of the oven and brush with maraschino cherry liqueur. Slice the rice cake into serving pieces in the pan when cool. Dust with powdered sugar. Now it’s hot. The kind of hot that forces you to sit still, preferably under a ceiling fan, sipping a cold drink. You can almost hear the grass growing taller and the air conditioner spending money. Everyone slows down. It’s so hot you don’t want to cook – not for anybody! But you still have to eat! At least with the recipes below, you won’t have to turn the oven on. This satisfying entrée for one or two is good for any meal, from breakfast to dinner. Serve with fruit or the salad below. Heat a 10-inch nonstick skillet over medium-high heat. Coat pan with cooking spray and add the olive oil. Add corn, zucchini and onions to the pan; sauté 4 minutes or until vegetables are crisp-tender. Remove vegetable to a bowl. Combine 1/4 teaspoon salt, water, pepper, egg whites, and egg, stirring well with a whisk. Return skillet to heat. Pour egg mixture into pan; cook until edges begin to set (about 2 minutes). Gently lift the edges of the omelet with a spatula, tilting pan to allow the uncooked egg mixture to come in contact with the pan. Spoon the corn mixture onto half of the omelet; sprinkle the corn mixture with cheese. Loosen the omelet with a spatula, and fold in half over the corn mixture. Cook 2 minutes or until the cheese melts. Carefully slide the omelet onto a plate. Blood Oranges are attractive in this salad when they are available in your area. Place greens in a large salad bowl. For dressing, whisk together olive oil, orange juice, and vinegar in a small dish. Pour dressing over greens, gently tossing to mix. Divide mixture into servings and top with onion rings, orange sections, and olives. Lightly sprinkle with salt and pepper. This is a lean pasta dish, filled with flavor as well as color. Serve as a main entree with the Caprese Salad (recipe below). In a 10-inch nonstick skillet, heat 1 teaspoon oil over medium heat. Add bread crumbs and toast until golden, stirring frequently to prevent scorching. Remove from heat and transfer to a small bowl. In same skillet, heat remaining 3 tablespoons oil over low heat. Add red onion and saute, stirring frequently, until soft but not brown, about 2 minutes. Add garlic and cook until soft, about 30 seconds. Stir in chicken broth and simmer until heated. Season with salt and red pepper flakes. Transfer mixture to a pasta bowl, and add basil, mint, parsley and thyme. Stir to combine. Cook pasta in 6 quarts salted boiling water until al dente. Drain pasta, transfer to pasta bowl, and toss with herb mixture. Sprinkle toasted bread crumbs on top and serve. Frugal Tip: I keep a zip bag in the freezer and add any leftover pieces of bread I have from dinner. When I need fresh breadcrumbs, I can pour out the amount needed and process them into crumbs. Alternate fresh mozzarella slices with sliced tomatoes, overlapping, in a circular design on a serving plate. This dish can also be cooked in your Slow-Cooker (about 8 hours on low or 4 hours on high). Serve with Olive Oil Mashed Potatoes and Green Salad. Frugal Tip: Bell peppers are in season now, so take advantage of their lower price. I buy extra peppers, slice them into thin strips and place them in freezer bags for the winter months. Frozen peppers work very well in casseroles or omelets or in sauces. 1. Rinse the chicken pieces and pat dry. Season with salt and pepper. Heat the oil in a large, heavy skillet over medium-high heat, and brown the chicken pieces, in batches, on each side for about 5 minutes. Transfer to a bowl or plate. 2. Turn the heat down to medium. Add the onion with a pinch of salt. Cook, stirring and scraping the bottom of the pan to deglaze, until the onions begin to soften. Continue to cook, stirring occasionally, until the onions are tender, about 5 minutes. Add the red pepper flakes and sweet peppers, a bit of salt and the garlic, and cook, stirring, until the peppers begin to soften, about 5 minutes. Add the tomatoes and stir together until the tomatoes begin to bubble and smell fragrant, about 5 minutes. 3. Return the chicken pieces to the pan. Cover and cook 25 to 30 minutes over medium-low heat, stirring at regular intervals and turning the chicken pieces over so that the ingredients don’t scorch and the chicken cooks evenly. The peppers should be very soft and the chicken quite tender. Add oregano, basil and freshly ground pepper; taste and adjust the salt. Peel potatoes and cut into 1-inch chunks. In a large saucepan, cover potatoes with cold water by 2 inches and add 2 teaspoons salt. Bring to a boil; cook until potatoes are very tender and easily pierced with a fork, 20 to 25 minutes. Drain; transfer to a large bowl. Using a potato masher or fork, mash potatoes with olive oil and milk until smooth. Season with salt and pepper. Drizzle with more olive oil before serving, if desired. Frugal tip: Early in the week, grill fresh tuna fillets for dinner and include an extra half a pound to cook and save for this recipe later in the week. In a large non metallic bowl combine all the ingredients, and mix well. You can serve this dish right away or refrigerate for two to three hours and serve with the grilled bread. Place the shallots and vinegar in a small mixing bowl and whisk to combine. Continue whisking and slowly add the olive oil. Season to taste with salt and pepper. Slice the steaks into thin strips and place them in a mixing bowl. Add the tomatoes, bell pepper and onion slices and half of the balsamic vinaigrette. Place the romaine lettuce in a separate salad bowl and toss it with the remaining vinaigrette. Arrange the steak, tomato, bell pepper and onion mixture on top. Serve with a roll. Healthy dessert to add to any of the menus. You can make it ahead, but don’t freeze overnight; the mixture will become icy. If using frozen fruit, remove mango and pineapple from freezer and let stand at room temperature 10 minutes. Combine mango, pineapple, yogurt, and lime in a food processor; process until smooth. Serve immediately (for soft-serve texture) or freeze in an airtight container for 1 hour 30 minutes (for firmer texture).